The Alpha-Step IQ Profilometer has a 5µm radius 60° cone stylus tip with a bevel height of 880 µm installed. The profilometer can measure vertical features ranging from under 100 Å to approximately 0.4 mm with a vertical resolution of 0.012 Å or 0.24 Å respectively. However, the minimum sampling rate is 0.01µm. The profilometer can accommodate samples up to 150 mm (6 in.) wide and 15 mm (.59 in.) thick. 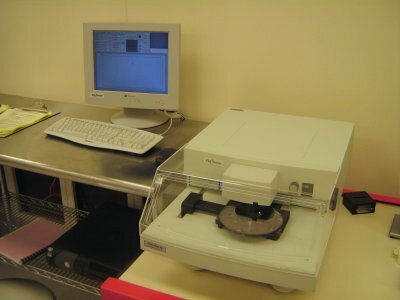 The profilometer is set up on a vibration isolation table to reduce noise, which can affect the minimum height and resolution. The maximum scan length is 2mm from right to left, 10mm from left to right, and scan speeds in the range of 2-200µm/sec. Analysis of the scan can be performed using the Alpha-Step IQ software measuring profiles, roughness/waviness, and the step height.